Pregnant women are attracted to healthier looking faces in what scientists believe is a subconscious effort to avoid illness. 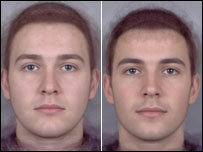 Teams from the universities of St Andrews and Aberdeen showed pregnant women two pictures of computer- generated faces. The faces were tweaked to show one unhealthy pallor and the other healthy. Women with high levels of the progesterone hormone chose the healthier face. Dr Ben Jones, of the University of Aberdeen, said pregnant women and those with raised progesterone are more attracted to men who appear healthier. He said: "Our findings suggest that pregnancy, or when a woman is in a similar hormonal state, trigger strategies within the body for avoiding illness during social interactions. "These could compensate for weakened immune system responses at these times and reduce the risk of maternal illness disrupting the development of the unborn child." The tests were carried out at the Perception Lab at St Andrews University. Professor David Perrett, head of the Perception Lab, said: "We show that women's choice of both friends and possible romantic partners is also guided by apparent health. "Every woman likes healthy looking faces, but women who are pregnant are particularly keen on healthy looks." The study found that the preference for healthier faces was stronger for women during the low fertility phase of their menstrual cycle. Dr Jones said the findings suggested women do not prefer healthier men because they would make good long-term partners, but rather to avoid illness. Previous studies by the Perception Lab suggested women at their most fertile tend to choose masculine looking men, presumably in the hope of securing strong genes.